My eight-year-old daughter was in a homeschool PE class last year, half the time (or more) I had to bribe her to participate (I told her she had to do regular school work while her sister and friends played PE if she didn’t participate.) Most of the time given the choice of book work or PE, she’d do PE. Sometimes she’d get into it, sometimes not. She’d say, “makes me tired”, I don’t want to run laps, etc. Lots of times she’d get into the fun and play. But it was definitely a hard sell. My question: Should I “make” her do it next year? Or find other ways of encouraging physical activity? She roller skates around the house all day if we let her, she rides her bike when the weather’s nice, she does cartwheels in parking lots and hallways, and takes dance once a week for an hour? Does she need a structured PE class all year to teach her things like softball, field hockey, etc.? It comes down to that same issue of getting our kids to own it and to be self motivated. Remember, that we can push our kids to do things that we want them to do, but so many times it pushes them out. They become internally frustrated and resent the activity. They feel the push and resist. They may go, but they really are not there. On the outside they may be running laps and doing jumping jacks, but on the inside they are hating it; resisting the coach, complaining and wishing they were at home taking a nap. So the key is to find a way, find something that encourages her to enjoy PE. First, let’s replace the word “bribe” with “encourage”. Bribing is usually for the benefit of the one doing the bribing; it can be manipulative, even when you feel you are doing it for the child. To encourage is honest, pure, and the benefit is for the person receiving the encouragement. Another good tool is building relationships. How about doing fun things with a few of the other kids outside of PE? Invite them over, have a sleepover, or a game day. 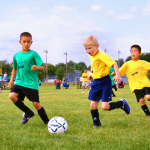 When they have some established relationships, they will want to participate more. Kids love to be with their friends… even if it involves work. One of the advantages of being involved in a structured class is that kids have to learn to do things according to someone else’s time schedule. Your daughter may not like to run when she’s not in the mood, but it’s good for us to do things we don’t necessarily want to do. 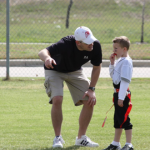 Kids can learn to respect someone else’s authority, learn new disciplines, and appreciate someone else’s instruction. Remember that PE not only teaches health and promotes physical fitness, but it also teaches things like relationship building, dealing with winning and losing, teamwork, persistence, and many other life skills. It sounds like once she gets involved, she has a good time, so don’t make it an option. If she knows this is what she does on these days at these times, because that is what her parents feel is best for her, and it’s not really up for discussion, she may learn to find the positive side of the PE class. So keep her doing cartwheels in parking lots and she can bring a new slant to PE class; cart wheeling to first base might be just the thing to keep her motivated to come to PE and the others may join in!